One of the most requested things when dealing with elementary OS is the lack of Flash. Installing the flashplugin-installer package works for Chromium and Firefox, but the bundled browser, Midori, will not detect this on 64bit systems. Instead of suggesting different ways for each architecture to deal with this issue, we have lovingly crafted a small script for the use of any elementary system. If you're not interested in how this works, skip to the next paragraph for the "how to" bit. Okay, the reason why Midori won't work with Flash nicely is fairly simple, and is rooted in it's code base. The way it accesses extensions requires them to be in 32bit, regardless of whether or not the system it is running on is. By default, however, elementary will only install the same architecture of Flash as your system. This set of commands downloads and extracts a 32bit copy of Flash, from their site. This one single method will work in both 64bit and 32bit systems by using the 32bit flash natively, or emulating it. Either way, it uses nspluginwrapper, which will pull in a lot of libraries (packages), but most of them should be quite small. You can download and execute this file or just copy and paste the whole block into your terminal, then follow the on-screen instructions. DO NOT run as SUDO. That doesn't work. Note that you may have to enable the extension (typically named Shockwave Flash) in the Midori preferences, and then test your installation. adobe.com/software/flash/about/ Tested in elementary, but should work in any Debian based system. Do NOT run as Sudo/Root. This will not work unless you use root as your default user. By executing this script, you acknowledge that you have read and agree to the Adobe Software Licensing Agreement. We host no part of Adobe Flash, nor any other Adobe software for download. This script uses their official servers. Note that receiving the error wrong ELF class: ELFCLASS64 is to be expected. This is your 32bit nspluginwrapper for Midori rejecting your 64bit copies of flash. Ignore these. Your script should end with an output like this. That last line signifies a successful install. 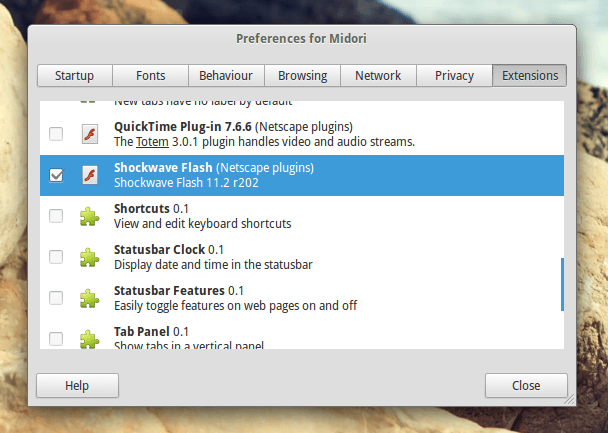 Remember to restart Midori if you had it open at the time, and enable the Shockwave Flash extension in the preferences.